1949. 17-year-old Ike Turner meets fellow Mississippian, Riley (later B.B.) King in his hometown, Clarksdale, where King is doing a gig. He cheekily asks King if he can sit in on piano. King agrees and, at the end of the evening, Ike invites him to stay at his mum’s house to save doing the sixty mile journey back to Indianola that night. The evening went well both musically and socially, an acquaintanceship was formed but the two were not destined to meet again for over a year. In 1949, Ike had been part of a large band called the Top Hatters. By the time Ike and B.B. met up again in February 1951 the Top Hatters had split into two groups – one called The Dukes Of Swing, who continued to do more sophisticated, jazzier stuff, the other, a more modern R&B combo run by Ike, called The Kings Of Rhythm. Ike and his group chanced upon a B.B. King performance when they were returning from one of their own gigs. Ike and B.B. renewed their acquaintance. Again, Ike requested if his band could do a number and B.B. was accommodating. The Kings Of Rhythm went down a storm and after the show B.B. told Ike that his group should be recording. B.B. offered to recommend them to a man in Memphis, where he recorded. That man was Sam Phillips. Sam duly contacted Ike who then arranged to come up immediately with his band. The Kings Of Rhythm were Ike’s group. There was absolutely no doubt that it was his band and that he made all the decisions. The group comprised Ike on piano, Willie Kizart on guitar, Willie Sims on drums with Raymond Hill and Jackie Brenston on saxes. Until recently the group’s lead singer had been Johnny O’Neal but he had just left, having got a recording contract with the King record label. Jackie, after leaving the army, learned to play the sax and had recently joined Ike’s Kings Of Rhythm, taking lead vocal on some songs when the group was on the road. On Monday 5th March 1951, Ike’s Kings Of Rhythm recorded five songs I believe, Ike taking vocals on two and Jackie Brenston taking the other three. By far the standout track from the session was Rocket 88, on which Jackie was lead vocalist. History was being made by the Kings Of Rhythm. When they went into the recording studio that fateful day there was only one name for the group and the only other possible variation of that name could have been Ike Turner’s Kings Of Rhythm. However, far-reaching complications were to follow and there are many stories and theories about why and how and what deals were done for what reason. In the early 1950s independent record labels were burgeoning in the U.S. Separately, too, there were studios that made the recordings but did not release them themselves, leasing to record labels for the best deal they could get. It was a little like the Wild West, with few rules, little loyalty and much double dealing. People’s noses were regularly put out of joint when they believed they had been wronged. The five tracks recorded by the Kings Of Rhythm were classic examples. At the time, Sam Phillips leased many of his recordings to the Bihari brothers who ran a couple of labels based in Los Angeles, mainly promoting Blues and R&B material. However, recently many of Sam’s recordings had not been accepted by the Biharis or their releases were being postponed for lengthy amounts of time, so Sam had been looking for other outlets, to bring in income. Leonard Chess had a stake in Aristocrat records, based in Chicago, from 1947 but in 1950 he changed the label name to Chess when he brought in his brother Phil and another partner to become the new owners. Chess was looking for more sources of material and negotiations had already taken place at the time Sam had recorded the Kings Of Rhythm. Sam offered Leonard Chess four of the sides just recorded as part of their initial trading together. A little bit later when the Biharis found out, they were very upset that they had not been given first option, which, I am sure, would have been exacerbated with the success of Rocket 88 (five weeks at No.1 in the R&B charts). Further mayhem reigned when, probably without Ike’s knowledge, two records were released by Chess under two distinctly different names – Jackie Brenston And His Delta Cats on Chess 1458 and Ike Turner And His Kings Of Rythm (misspelled) on the other, Chess 1459. Sam was convinced Rocket 88 was hit material and between him and Leonard Chess both probably thought the issuing of two records simultaneously by different groups was the way forward to maximise profits. It did not seem to matter that no such group as the Delta Cats existed and, at the same time as the recordings, Jackie was just a member of the Kings Of Rhythm. Ike complained bitterly when he heard that Rocket 88 was not to be released in his group’s name but, before its success was established, he had been placated to some degree by the release of a record highlighting his name, Heartbroken And Worried by Ike Turner and his Kings Of Rhythm. 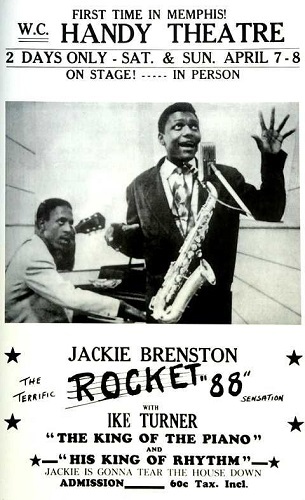 And here is Rocket 88 by the Kings Of Rhythm labelled as Jackie Brenston and his Delta Cats. Despite liberties being taken by Phillips and Chess and the rights and wrongs of proper accreditation, there is no doubting the significance of the release of Rocket 88. By comparison, Ike’s Heartbroken And Worried was vocally weak and pedestrian, sounding like a poor man’s Charles Brown, compared to the exciting all-guns-blazing Rocket 88 with Jackie on lead. These two records were made within hours of each other and there could not have been better examples of the distinction between the old and the new music. Rocket 88 is oft quoted as the first Rock‘n’Roll record although that would be a subjective judgement and, of course, there are rightfully other contenders for that accolade (see Footnote). In the footsteps of the machinations behind the release of the two records came more problems – the breaking up of the Kings Of Rhythm and the obvious difficulty that caused when Rocket 88 became a big success and a follow-up was needed. But those problems were a little bit down the line. The split of the Kings Of Rhythm did not happen immediately. Rocket 88 did not enter the R&B charts until 12th May 1951, nearly ten weeks after the recordings and perhaps it is safe to assume the bigger success it became, the bigger the rift between the parties involved – between the have and the have nots. Certainly, the Kings Of Rhythm were still performing together on 7th and 8th April, to sellout audiences, five weeks after the recordings, as shown by this poster. However, the split of the group was not long in coming. From the recordings on 5th March there was only one track ‘in the can’ by the Kings Of Rhythm. It was called Independent Woman and did have Jackie on vocal. Arrangements were made by Sam Phillips, under great pressure from Chess to hastily arrange new material by Jackie Brenston with a new backing group, but it was taking time to produce a follow-up. What happened next was extremely bizarre and seems almost beyond comprehension. It appears a catalogue number (Chess 1469) was designated to Jackie’s follow-up but they did not have the material ready, so nothing could be released. With further machinations by Phillips, apparently with Chess’s knowledge, he got a singer called Billy Love to record his own song, Juiced, bought the full rights to it for $100 and passed it off as Jackie Brenston and his Delta Cats. That record coupled with the ‘in the can’ Independent Woman was released at the end of July 1951 on Chess 1472. That record did not sell in any quantity and soon after, with new material, Jackie recorded again, backed by a different band. The shelved catalogue number Chess 1469 was resurrected and released in October 1951 – at least two months after Chess 1472! Back to Ike. He was born Izear Luster Turner on 5th November 1931 in Clarksdale, Mississippi. Whilst still at school he worked as a janitor/lift operator at the Alcazar Hotel in his hometown. In 1944, around Ike’s 13th birthday, a new radio station (WROX) started broadcasting from part of the Alcazar building. WROX moved to a brand new studio less than a year later and young Ike was regularly hanging out there, which led to him assisting with deejay duties. He learned piano but, after hearing Pinetop Perkins playing boogie-woogie at WROX, Ike became convinced that was the style he wanted to play. It was also at WROX that Ike came into contact with Robert Nighthawk, for whom he acted as a roadie and sat in on the occasional gig. In the late 1940s, Ike moved into the Riverside Hotel in Clarksdale where travelling Blues musicians would stay. It was there he came into contact with Sonny Boy Williamson II and later where Ike would practise and work on his group’s act and material (see Footnote). Ike was still only 19 when Rocket 88 was recorded but he learned fast from his experiences. Although he had missed out and did not get the true credit he deserved, he must have impressed Sam Phillips with his piano playing and organisational skills. Ike already had connections from playing with his group around the Mississippi area, so his contact list was growing. He got to play piano on Howlin’ Wolf’s How Many More Years, recorded 14th May 1951, which remained Wolf’s highest ever chart entry reaching No.4 in the R&B charts – even Smokestack Lightnin’ in 1956 only ever reached No.8. His contact with Wolf led to Ike recording him for the Biharis in September 1951. B.B. King had already been recording for the Biharis’ RPM label through Sam Phillips’ Memphis Recording Service since mid-1950 without any commercial success, but on 27th May 1951 B.B. recorded Three O’Clock Blues with Ike on piano. It entered the R&B charts in December and soared to No.1 where it remained for five weeks early in 1952. Around August 1951, Sam Phillips twice recorded Rosco Gordon singing Booted and forwarded different takes to both Chess and the Biharis. At the first session when Booted was recorded (for Chess), Rosco also duetted with Robert (later Bobby) Bland and sang I Will Love You Till The Day I Die which was Bland’s first recording. About three months later Ike was instrumental in getting Bland recording again, with himself on piano, for the Biharis. 1951 ended up a good year for Ike despite the Rocket 88 saga. The year finished with him being associated with historical recordings of Howlin’ Wolf – his first record and biggest hit, B.B. King’s first R&B No.1 hit and Bobby Bland’s first solo recording. As can be seen from some of the dealings of Sam Phillips with Chess and the Biharis with multiple recordings, something had to give and lawsuits followed, mainly to do with Howlin’ Wolf and Rosco Gordon. Ike had run sessions in West Memphis for Wolf including some of the same songs Sam had leased to Chess, with slightly amended titles. The upshot was, after much legal wrangling, that Chess got to have exclusive rights to Howlin’ Wolf and the Biharis got the rights to Rosco Gordon’s material. In early 1952, Rosco reached No.1 in the R&B charts on the Biharis’ RPM label. By the time 1952 started, his own group, the Kings Of Rhythm, had broken up and the main people Ike earned money from, Sam Phillips and the Biharis, were exchanging lawsuits. A noticeable, recurring theme with Ike was that although there were fallings-out, he often worked again with those people in the future and that included the Kings Of Rhythm individual members, Sam and the Biharis. At the beginning of 1952 Ike, barely 20 years old, was asked by the eldest Bihari brother, Lester, to act as a talent scout for him. Although the Biharis’ record labels were based in Los Angeles, Lester had detected the untapped talent around the Delta region and had made the decision to open a subsidiary in Memphis. At first Ike found older style blues singers to record, such as Houston Boines, Drifting Slim, Charley Booker and Boyd Gilmore. Ike would not only source the artists, he would arrange the recording sessions and act as a session musician as well. He would also feature in the Biharis’ main artist B.B. King’s recordings. Although Ike played guitar his main instrument at the time was still the piano and here he is sympathetically accompanying B.B. King on You Know I Love You. This song also made No.1 in the R&B charts, following in the footsteps of Three O’Clock Blues. You Know I Love You was to feature again a little bit later in Ike Turner’s story. Although Ike played on over a dozen different artists’ records in 1952 and 1953 he did very little recording in his own name. In April 1952, he recorded with Ben Burton and his Orchestra and with Bonnie Turner – both records being released on the Biharis’ RPM label. In 1953, he had no records released but did a session of four different songs at the Sun studio; these remained unissued at the time. Bonnie was possibly Ike’s third wife but it has been difficult to keep track of the number of his marriages. The total number through his life could be into double figures but whether these were legally recognised marriages or whether various partners just took the Turner name I have found hard to establish. Johnny O’Neal had already been a lead singer with the Kings Of Rhythm prior to Rocket 88 but in 1952 Ike recorded him again under the pseudonym Brother Bell, singing Whole Heap Of Mamma. It was released on another Bihari label, Blues & Rhythm, and to me it sounds very much like some of the old Kings Of Rhythm could be in the backing group. One of Ike’s signings was Junior Parker who he got to record for the Biharis’ Modern record label. In West Memphis Ike recorded Junior’s first record in his own name, Bad Women Bad Whiskey/You’re My Angel. Both of these sides can be heard in the excellent Junior Parker Toppermost (#627). You’re My Angel features a great Raymond Hill sax break, with Ike’s piano playing ever present. Junior was later to move on to Sam Phillip’s Sun, before recording for Duke between 1953 and 1966. Elmore James was another big name Ike got to record for the Biharis. Surprisingly, in his own name, Elmore had only recorded one single track by the beginning of 1952, when he was 34 years old. That single recording was Dust My Broom for Lillian McMurray’s Trumpet record label. Elmore had been a guitarist on Sonny Boy Williamson II’s Trumpet recordings from the beginning of 1951 but Dust My Broom became a hit, reaching No.9 in the R&B charts. Both sides of the record were released as though they were by ‘Elmo James’ but the flip was actually by another artist, Bobo Thomas, who seemingly never recorded again. Although Ike got Elmore to record from the beginning of 1952 those recordings for the Biharis’ Flair label had their releases delayed for nearly two years, probably due to a dispute with Trumpet records over Elmore’s contract. However, this one, Please Find My Baby, with Ike on piano, was recorded in January 1952 and finally released in December 1953. Virtually all of Ike’s musical accompaniments up to sometime in 1952 had been on piano but he started to work on and perfect his guitar technique. He got Willie Kizart from his old Kings Of Rhythm group to help with some advice but went on to have few superiors. By mid-1953, Ike seems to be back working with Sam Phillips who had now started his own Sun record label early the previous year. Little Milton had been in a recording studio backing Willie Love in 1951 but on 21st July 1953 Ike brought Little Milton (Toppermost #449) to Sun where he recorded his first record Begging My Baby with backing from some of the Kings Of Rhythm including Ike on piano. Little Milton had not yet found his own niche and on this track one can hear the Fats Domino influence. I have mentioned that Ike did a session of four titles in 1953 that were unreleased at the time. The personnel on some of the tracks included Bonnie Turner, Raymond Hill and Willie Sims. Immediately after that session on 2nd August some remarkable tracks were recorded with Johnny O’Neal former lead singer of The Kings Of Rhythm (pre-Rocket 88) with Ike on guitar. Here is Dead Letter Blues based on the Ida Cox (1924) and Son House (1930) recordings. I find it unbelievable that this was not released. This is 1953 and Ike’s stinging guitar is fantastic and ahead of its time. The only reason I can find is that at the time Sam Phillips was short of money. At the same session O’Neal recorded two other titles, Nightmare (Johnny’s Dream) and Peg Leg Baby, that were to surface in a different form later. Ike got frustrated at the lack of record releases by Sun and decided to set up his own recording studio in Clarksdale. Although he still continued his work at Sun, by the beginning of 1954 Ike started to produce his own recordings as well. One of the first things he did was to record two versions of the track that was based on the unreleased Nightmare (Johnny’s Dream). At the Clarksdale studio Ike made what he called Sinner’s Dream by Eugene Fox, which came out on Chess’s Checker label. The other version called The Dream was credited to The Fox and was issued on the Biharis’ RPM label. A bit of deja vu there. Eugene Fox was an old school friend of Ike and had been a member of the pre-Kings Of Rhythm group, the Top Hatters. There looks to have been a bit of a conflict of interest with those two new versions on different labels – but maybe Ike was used to coping with such problems. In 1954, Ike was connected with the Sun recordings of Billy ‘The Kid’ Emerson, Little Milton and a pair of instrumentals, The Snuggle and Bourbon Street Jump by sax player Raymond Hill, which had Ike playing guitar. Ike was also on guitar on the Emerson coupling, No Teasing Around/If Lovin’ Is Believing. At Clarksdale, Jesse Knight and Billy Gayles were recorded, plus Dennis Binder who had also been present on the Eugene Fox recordings. Here is Dennis on piano with Ike on guitar performing I Miss You So which owes a bit to Fats Domino. By now, Elvis had recorded That’s All Right and Sun were very much concentrating on more rock‘n’roll and rockabilly stuff, invariably by white artists, so Ike’s work dried up there. Generally, the popular music scene was changing apace. Ike was forever trying new things. The Kings Of Rhythm had reformed and by 1955 were back to best part of the 1951 line up. Ike decided St. Louis was the place to be and moved there, where he built up a full gig schedule. The group would often play in St. Louis, Missouri in the evening and then cross the Mississippi River and stateline to East St. Louis, Illinois to play at a different venue until dawn. Between live dates various combinations of the group would record in Cincinnati for Syd Nathan’s King subsidiary label, Federal, which was mainly devoted to R&B releases. In 1953, Johnny O’Neal recorded Peg Leg Baby at Sun but it had remained unreleased. In 1956, the song was resurrected and it came out on the Vita record label with the amended title Peg Leg Woman by Willie King with the Ike Turner Band. The songwriting credit is given as Ike Turner and it is believed that Willie King was a pseudonym for Billy Gayles. Billy Gayles, together with band members including Raymond Hill and Jackie Brenston on saxes plus Ike on guitar, was in Federal’s Cincinnati recording studio on 12th March 1956. Included in this session was a cut called I’m Tore Up. It was credited to Billy Gayles with Ike Turner’s Rhythm Rockers and is one of my top 10 selections. Three further records were issued by the same grouping but on 13th September 1956, at Federal, Billy Gayles was replaced by Jackie Brenston on lead vocal. It seems at that point Jackie’s repatriation back into the fold was complete, although it is said that Ike never allowed Jackie to sing Rocket 88 at their live performances. Gonna Wait For My Chance – Jackie Brenston with Ike Turner’s Kings Of Rhythm – is another of my top 10 choices. 9th April 1957 again saw virtually the same grouping record. This time Clayton Love took the lead vocal. However, this record, also chosen as a top 10 selection, was credited to Ike Turner with his Kings Of Rhythm with a small side note ‘vocal by Clayton Love’. Two further records followed later in the same year by the same personnel but this selection is titled She Made My Blood Run Cold. 1957 proved to be a pivotal year for Ike. His career was going great guns. He and his group were the premier band both sides of the river in St. Louis/East St. Louis. It was then he came into contact with 17-year-old Anna Mae Bullock. According to Bruce R. Olson’s book “That St. Louis Thing, Vol.2: An American Story Of Roots, Rhythm And Race”, the following story unfolded, with quite detailed information. It was at one of Ike’s regular venues, Club Manhattan, during an interval when he was playing You Know I Love You on the organ that one of the band members noticed that his girlfriend’s sister was singing the words to herself and he took the microphone over to her. She then started singing the song on which Ike had backed B.B. King five years earlier. Ike was impressed. Shortly before this historic meeting Ike had bought a large house in the St. Louis area. Besides being a new home for every member of the band it inherently relieved what had been a headache for Ike – band practice. He had been experiencing difficulty getting everybody together at the same time. Now, with everyone under one roof, arranging things became much easier. It was at this house that a recording called Boxtop was made in 1958, credited to Ike Turner, Carlson Oliver & Little Ann. Little Ann was, of course, Anna Mae Bullock who later became Tina Turner and that was the first time she appeared on record. In the same year, 1958, Anna Mae gave birth to a baby boy, fathered by group member Raymond Hill. 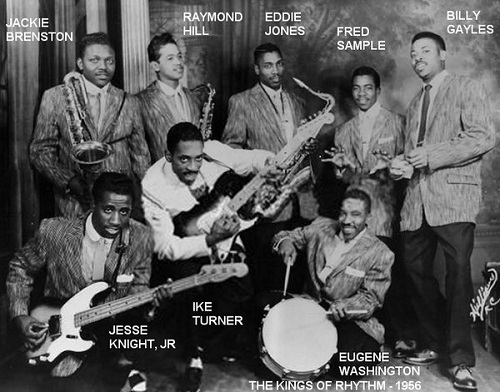 1958 also saw Ike Turner’s Kings Of Rhythm change allegiance to Cobra Records based in Chicago. It was there Ike did a reworking of Box Top without Little Ann and cut a record that came out on Cobra’s subsidiary, Artistic, with a different lead singer – Tommy Hodge. With a group that included Willie Dixon on bass and Odie Payne on drums, this is Down And Out with great guitar from Ike. The record is credited to Ike Turner’s Kings Of Rhythm with a side note, ‘vocal by Tommy Hodge’. While at Cobra/Artistic, Ike can be found on a pre-Chess record by Buddy Guy called You Sure Can’t Do. He was also on Otis Rush’s Double Trouble record, in a group that included Jackie Brenston, Willie Dixon, Odie Payne plus Little Brother Montgomery on piano. It was generally accepted that Ike was on second guitar but some sources seem to now believe that it is Ike on lead guitar, making that unbelievably good sound. Listen to Double Trouble. In addition, whilst at Cobra, Ike displayed his dexterity on an early Betty Everett record. This was 1958 before her 1963/64 commercial successes with You’re No Good and The Shoop Shoop Song (It’s In His Kiss). On one side, Tell Me Darling, Ike plays guitar but on the other side he plays the piano accompaniment. This is I’ll Weep No More by Betty Everett and The Willie Dixon Band. During 1959 Ike recorded a few titles for the small Stevens record label. These sides were made under the pseudonym Icky Renrut (clever that!) and were recorded in East St. Louis. From the four tracks released, I’ve chosen Ho Ho to finalise my top 10. In 1959, Ike was charged with conspiracy in respect of forged cheques. At his first trial in St. Louis the jury failed to reach a verdict but a year later, at the retrial, he was found not guilty. Ike saw out the 1950s by signing up with Sue Records, where he was soon to be riding high with Tina, as Ike & Tina Turner. 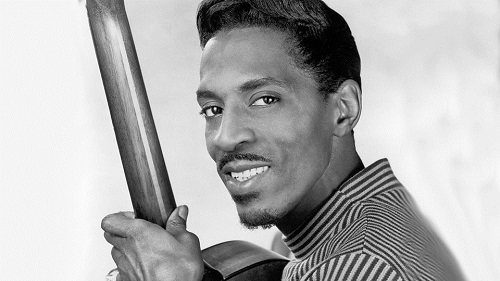 It cannot be overstated what an influence Ike Turner had on the 1950s music industry. He was an absolutely top class pianist and guitarist and the artists he helped when they were just beginning to record reads like a Who’s Who of post-war Blues and R&B talent: Howlin’ Wolf, B.B. King, Bobby Bland, Junior Parker, Elmore James, Little Milton, Betty Everett and Tina Turner – all of them moved on to bigger and better things but it was Ike who was there enhancing their careers at the start. Ike performed many duties. At various times, in addition to playing the piano and guitar brilliantly, he had been a deejay, a roadie, a bandleader, a talent scout and a record producer and arranger. He had a reputation as a hard taskmaster but he got things done – he was an experimenter, an innovator, an entrepreneur and organiser. He was ambitious, a survivor, a hustler, a wheeler-dealer, a pragmatist and the ultimate ‘go to’ man back in the fifties’ music and record scenes and to think he was still only 28 at the end of that decade. Whatever anybody thinks of Ike Turner his contribution to popular music should never be overlooked. 1. This Ike Turner Toppermost evolved from an idea of Dave Stephens. He had asked me to assist him in doing an Ike & Tina Turner Toppermost encompassing their stories up to the mid-1970s. When we discussed it in a bit more depth it transpired that we agreed Ike’s story pre-Tina was too big to just be a lead-in to their recordings from 1960 onwards, so I have tried to do justice to Ike’s career to the end of the 1950s and Dave has produced an Ike & Tina Toppermost from 1960. To complete the trilogy we hope somebody might, at some later stage, do a Tina Turner Toppermost covering her solo career after her split from Ike. 2. There is no doubt in my mind that Rocket 88 should have been credited to The Kings Of Rhythm or Ike Turner’s Kings Of Rhythm. Whereas for the last sixty years or so it has been usual for the vocalist’s name on any recording to be highlighted it was not necessarily the case before the mid-1950s. Many records on which Little Esther (Phillips) was the vocalist were credited to just Johnny Otis and his Orchestra and Little Willie John’s vocal on a 1955 recording of Betty Ann was credited to just Paul Williams and his Orchestra. 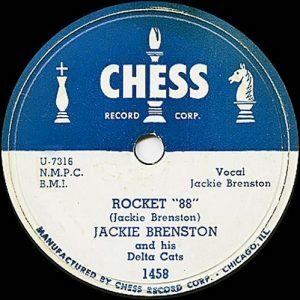 These are just a couple of examples out of many hundreds around that time so, in 1951, there was no reason to credit Rocket 88 to what was a non-existent group called Jackie Brenston and his Delta Cats. 3. Rocket 88 referred to the trendy new-at-the-time Oldsmobile Rocket 88 car – unless, of course, Jackie was really singing about something else completely different. 4. Rocket 88 is regarded by many to be the first Rock‘n’Roll record but it was derived from Jimmy Liggins’ Cadillac Boogie recorded in 1947, although nobody is claiming that version is rock‘n’roll. All music evolves and there would be many other contenders for the first rock‘n’roll record, including Good Rocking Tonight by Roy Brown (1947), Rock The Joint by Jimmy Preston (1949) and The Fat Man by Fats Domino ((1949). In my Robert Johnson Toppermost (#55) I even ventured Hambone Willie Newbern’s Roll And Tumble Blues (1929) might be a candidate. 5. Despite the merits of Rocket 88 being the first rock‘n’roll record as I have discussed, I think there might be another factor involved behind its candidacy. When it was recorded in March 1951 it would have been originally aimed at a black audience. Three months later, in June 1951, a hitherto country singer and his group, Bill Haley and the Saddlemen, covered the record and it was a regional hit, bought by whites. Of course, Haley went on to do Rock Around The Clock and when that became a No.1 pop hit in 1955 I think people looked back, found that Bill had done Rocket 88 in 1951 and thought that must have been the first rock‘n’roll record. 6. The Riverside Hotel, Clarksdale where Ike resided in the late-1940s and travelling bluesmen stayed, had been a hotel since 1944 but before that the building was the G.T. Thomas Hospital serving African Americans. It was to these premises that Bessie Smith was brought after her road accident in 1937 and died there. Cal Taylor has avidly collected records since the early 1960s, gravitating to deep soul and blues. 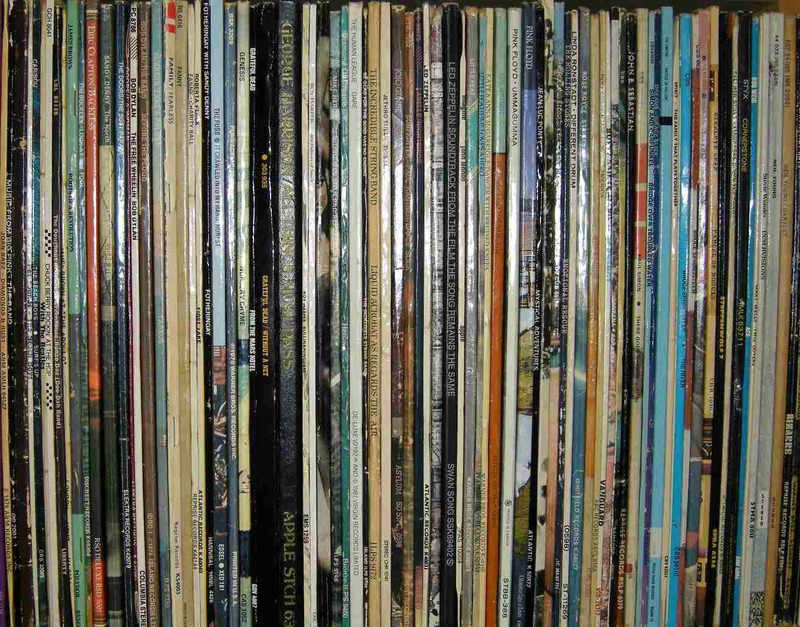 As time went on he got more and more into studying pre-war blues and accumulated a vast record collection. Cal saw many such artists live in the sixties. He has written several posts for this site including Charley Patton, Robert Johnson, Blind Willie Johnson, Howlin’ Wolf, Otis Redding, Betty Harris, and several more joint posts with Dave Stephens including Arthur Alexander, Big Joe Turner and Chuck Willis. Ike was a talented musician but he was his own worst enemy. He can’t take credit for Tina’s natural talent but for all his faults, he gave her a platform to shine. Ike was an established musician before he met her. He discovered many bluesmen such as Howlin Wolf and Little Junior Parker. Elvis used to sneak into clubs to watch Ike’s Kings of Rhythms play! He was a pioneer and unfortunately like many talented musicians he was also very troubled. Cal, thanks for this fascinating and brilliantly informative piece. And thanks also for introducing me to Hambone Willie Newbern. Thanks for your comment, Andrew. I’m glad that you found this Toppermost fascinating and informative. I’m also pleased to have been of service in introducing you to Hambone Willie Newbern. Everybody interested in Rock and Blues should know about Hambone!